When people find out I proofread romance novels for a living, they get very excited and want to know everything about what I do. Most people can’t even believe that such a job exists! But it’s real, and I’ve been doing it almost every day for well over a decade now. I’ve always been an avid book reader, so it was only natural for me to work in publishing. I’m going to give you the inside scoop on what it’s like to proofread romance books, and how you can get started. Since romance is the top fiction genre on Amazon, and proofreaders are in demand, I have some free training options you can register for to learn more about proofreading, publishing, and lots more good stuff! I didn’t intend to get into romance novels when I packed up my bags and went to publishing school. In fact, I had dreamed of working in women’s magazines or editing “serious” literature. I had studied Russian, French, and South American literature in university, and never once thought of romance as something I was interested in. Of course I had read some romance novels as a teen, but they weren’t something I wanted to pursue professionally. After I completed my post-grad program in publishing, I worked briefly as a freelance proofreader and editor. When I heard about an opening at Harlequin, a global publishing house, I decided to apply—and landed an in-house proofreading job! Did you know that romance books are a billion-dollar industry and one of the top categories in Amazon? It’s a serious business, as I quickly learned. Harlequin is the largest publisher of women’s fiction in the world, and is known mostly for their romance novels, although they do publish books in various genres under numerous imprints. Harlequin was a great company to work for, and I really enjoyed my time there. When a company’s biggest day of the year is Valentine’s Day, and everything is women-centric, how can you go wrong? As soon as I started, I fell in love with my job. I fell in love with the stories. I was shocked to find myself getting teary eyed over romance. Romance has its share of tragedy, I’ll tell you that. And most importantly, I was delighted to discover that romance books are full of strong, independent women. The romance stories I was reading were SO different from the ones I had read as a teen. After a few years working in a corporate environment, I left my cubicle to break out on my own and freelance. As much as I loved my coworkers and the company, I realized that I’m just not suited for the 9 to 5 life. The company has very high editorial standards, and provided me with incredible training in proofreading and copyediting, so I felt totally confident in my abilities to make it as a freelance proofreader. This is the BIG question. Everyone wants to know, so I’m going to be 100% truthful. It’s entertaining and enjoyable and I can’t believe I get paid to proofread romance novels. I’m grateful every day that I get to sit down and get lost in a love story and fix errors I come across. I’ve never been bored once. I even briefly entertained the idea of writing romances, like my friend Vicki So, who is also a proofreader. Every writer has a different voice, and while all of the books are centered around romance, each story is unique. Depending on the subgenre, some books are lighter on romance or heavier. For example, in a dramatic thriller novel, romance will be a subplot meant to drive character development. Whereas in a medical romance, finding love is the central theme. Do you want to proofread romance novels for a living, too? With the proper training and guidance, you definitely can. I think it’d be great if more people did. You can do it full time as a freelance proofreader or as a side hustle. And if you can proofread romance books, you can definitely work on other genres, as well. 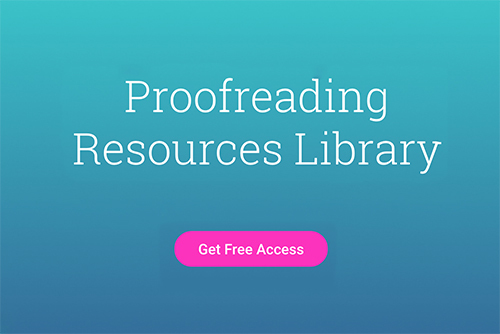 To learn more about the publishing and proofreading industries, and to see if proofreading is right for you, I’ve got a free introductory class for you. The only downside is that some people don’t take romance seriously, and as a result, they look down on me and can be condescending. They judge my skills based on the genre, and fail to realize that proofreading romance books is exactly the same as proofreading a sci-fi or mystery novel, or even “serious literature.” However, publishing professionals take it seriously, and that’s what really matters! Fiction and nonfiction books all require the same proofreading and copyediting skills, including knowledge of the same editorial tools and processes. It doesn’t bother me, though, as I see it as their problem and not mine. I’ve discovered that romance is everywhere. It adds depth and character development to any story, and it’s something everyone can relate to. Who doesn’t want to feel love—to give and receive it? It wasn’t until I started working with romance that I realized I’m a big romantic at heart. And you know what? After all this time, I still cry, laugh, or cheer over a good love story. Do you like romance novels? Which are your favourites? Tell me in the comments below! I’ve read a lot of romance novels. I’ve books on IBooks, Kindle and Bluefire. Authors I’ve read are MIA Caldwell, Marie Rochelle, Kaye Blue, Theodora Taylor to name a few. I’ve noticed on certain authors ebooks, the spelling is incorrect or the lead character name is different from the cover story. Is it possible to take your 5 day course after work which is after 4pm? I love reading books. I would like to proofread romance ebooks. I have romance ebooks in IBooks, Kindle and Bluefire. Authors – Mia Caldwell, Erosa Knowles, Theodora Taylor, Kaye Blue to name a few. On some author’s spelling or lead character name wasn’t correct. I have a day job working from 7am to 4pm. I would consider proofreading romance a dream job as a side hustle. I would like to to take the 5 day course after I get home from work. I love Nora Roberts, Joan Johnston, Judy Christenberry, and Kathleen E. Woodiwiss and more authors. I love Nora Roberts with her characters of the MacGregors. I always go back and reread my books that I have kept. I have always loved reading these authors and others. If I could do this for a living I would love to lose myself in a good romance novel. Ah, the McGregors! Such a good series 🙂 Working on romance novels totally doable. If a girl raised in a small Mennonite town like me can do it, then anyone can! I’m an old English major. I’ve worked as a secretary, a technical writer, and an author. For the past two decades I’ve been HOOKED on romance novels, and have been struck by punctuation and usage errors that have been allowed to remain in the pages of at least one particular author (not my favorite). Recently I’ve returned to my first love: cozy-type murder mysteries. Now that I’m retired, I could do with some supplemental income. Afraid I’m too feeble to be a Walmart greeter, too absent-minded for office work, too cranky to be a receptionist or for sales, and too lazy to check groceries. But I’ remain an addicted reader. What you offer interests me like nothing else. Aren’t romances the best? And I love cozy murder mysteries, too. Have you read any published my Worldwide Mystery? The have some really great titles. I’m happy you’re enjoying the content on the site, and if you have any questions about taking your reading interest further, let me know! Hello! I’m trying to get my proofreading business going and am trying to figure out how to find clients. Do your courses touch on that or do you have any suggestions? Thank you! Yes, my course, High-Level Proofreading Pro teaches you how to market yourself, find work, communicate with clients, etc. There’s a module just for business and marketing. You can find more info about the course here. Kathleen Woodiwiss was my first fave romance novelist. Lately (maybe because I’ve been single for so long) I’ve been reading black Ops adventures like Vince Flynn, as well as murder mysteries. My career has been technical so my writing is much more technical. I find it hard to get far without numbering steps and giving instructions. But I love the idea of proofreading for novelists! I think this is the answer to ‘What’s my New Year’s resolution?” I’m definitely saving this post and following! I’m looking forward to going through your free courses! Oh, yes, I’ve worked on my share of black ops books and murder mysteries. I’d have to say murder mysteries are one of my faves, especially if there’s humour. Working with authors would be a great new years resolution! I hope you have a fabulous 2019! I have been an avid reader my entire life. I love Romance, and have devoured Nora Roberts, LaVyrle Spencer, Susan Mallory, Kristen Hannah, Julia Quinn, Julie Garwood, Kathleen Woodiwiss, Jude Devereax, and so many others. As a librarian at the secondary level, I was exposed to and learned to love many young adult authors as well. So reading has been a passion, but also a profession for me. I have proofread doctoral theses, biographies for a small publishing company that didn’t make it, and many teaching manuals. What could be better than to note the mistakes I often find and have someone pay attention to them? I am known as a grammar Nazi. I am not offended by that title, but I am offended by the misuse of our language and its punctuation. This generation has done more harm to the English language than any other I have lived through. Their total lack of knowledge of comparative and superlatives is a pet peeve of mine. I also hate that they believe they can add ing to any word and be correct. I plan to explore your courses and would love to believe this could really lead to employment. I love Susan Mallory — her books make me cry more than anyone’s. It sounds like you have a strong background in books and working with text. I know contemporary writing can be unsettling at times, but as proofreaders and copy editors, it’s good for us to remember that language evolves and reflects current times. Also, these days, publishers and clients want you to be flexible. I hope you enjoy the articles and courses! Reading is my passion. Romance, paranormal romances, historical romances. Every extra minute I have I’m reading. I also find myself pointing out mistakes I find while reading. So I think this would be a wonderful opportunity. I want to do this too! I’m already a “hey, I’m happy to proofread for you” kinda person. And what’s not to love about proofing books I enjoy? Romance novels are the niche I want to concentrate on for proofreading. Romantic Suspense and Paranormal are my jam. Super excited to learn more about your course so I can do this for a (part-time) living! I absolutely love everything that Nora Roberts, Julia Quinn and Karen Kingsbury write. I love knowing that their characters are absolutely real to them, so vividly that they are able to walk out their lives through love, trials and of course, relationships, throughout sequels, and trilogies, and even series, if we’re really lucky. I fall in love with their characters so completely that I hate finishing a book wondering, wanting the story to go on, needing to know the rest of the story. Sometimes they flesh out characters so brilliantly that you end the book almost devastated, hoping there’s a sequel, praying maybe even a trilogy, in the works. Honestly, I LOVE their books so much, that I’d, gratefully, proof anything they wrote for free! Hi Carla! Those three authors are such masters at storytelling. I always fall in love with the characters, too, which is why I end up crying when there’s hardship. Series books are great, especially when they’re centred around a charming little town. Have you read Susan Mallery? She’s great, too! I absolutely love to read! Words become alive to me, so much so, that I keep most books I read, and re-read them, sometimes several times. For years I’ve dreamed of making a living as a proofreader. In fact, one of my password security questions used to be, “What is your dream job?” Of course, my answer was “Reading”. Every time I read a romance novel and stumble across an error, I’m so invested in the story, that I can visualize and hear the characters, so any error disrupts the flow, as a record that skips would. My first thought is always, how I wish I could make a living doing what I love. Reading! I didn’t know you’re a psychic, Anita! That’s amazing! I’ve seen psychometric psychics in the past and was always very impressed. And I’ve actually read a few romances starring psychic characters. So good. I come from a long line of psychics! No matter how much I try to dodge it, I can’t escape! 🙂 So now, I go with the flow. By the way psychometry is, without doubt, my favourite way of reading. Apologies for the delay in responding. The bones in my hand are taking a long time to fuse. No worries. I just hope that you’re feeling better!